The Lottie Doll series was introduced in 2012 to offer an appropriate doll for young girls. 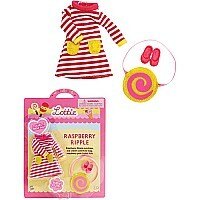 Lottie has a 7.5" childlike body, easily combed hair, bendable knees, movable legs and arms, and is easy to dress. Her outfits are made to match her adventurous spirit. Even the packaging is minimal and made to be used as a tote. Now this is a doll we can love! (Dolls sold separately). For ages 3-9 yrs.